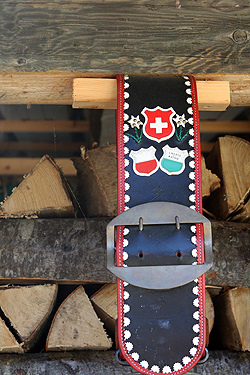 Everyone has a story about the Swiss, which sometimes ends up with them getting reprimanded for moving something out of the exact place where it belongs. Or arriving 12.5 seconds too late and missing a train. So I was freaking out when I was en route there because I filled out the blank spaces myself on my railpass that asked for my name and passport number. Just after I did that, I read that it said not to do that: the station agent must be the one to take care of it. I’ve learned what happens when you infringe on the rules in France and I was expecting them to void my ticket and force me to buy a new one. I was once on a train to Lyon and the birth date on my ticket was wrong—it said the actual date of the day of travel (that date) rather than the day I was born. And the conductor insisted I buy a brand new ticket. Ready for a fight, when the agent at the Swiss ticket window thanked me for filling out the information, so he didn’t have to, all stress that I was carrying around instantly melted away, like a big pile of grated cheese in a warm simmering pot of Fondue. Because Lausanne hosts a large university, it has a friendlier vibe than a lot of other cities in Switzerland. Plus the entire town is walkable and I only took the clean, efficient underground twice. Which makes this a nice place to explore for a weekend. To me, it’s hard to travel anywhere for a couple of days because I have to spend the first few days getting acclimated to the streets and transit system, and have to deal with the frustration of getting lost (which I have an unfortunate tendency of doing) but here I was off and exploring right after I arrived. The locals are fluid at being multi-lingual and polite and friendly. And on a more personal note (more so than revealing my never-fail ability to get hopelessly lost in whatever city I visit), there were plenty of restrooms available for use on the streets and in cafés. So you could drink as much coffee or Swiss wine as you liked and not have to worry about having any urgencies to deal with, as you do, um, elsewhere. Speaking of Swiss liquids, truly, I’d never heard anything about Swiss wine because I found out that so little of it is exported. 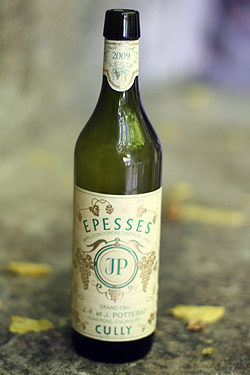 The white wines from the region of Leman, specifically in Lavaux are mostly made of Chassela grapes and served brisk and icy-cold. I’ve made the switch to white wine recently and nothing is better than a glass of the local white alongside a rich cheesy plate of Raclette or Fondue. For those who really want to taste a large selection of Swiss wines in one place, Vinorama, which unfortunately is in a sleek, modernist building on the side of a small highway that doesn’t take advantage of the magnificent lake view just outside. Still, it’s good for those who want to do a tasting or make some purchases. And with the efficient Swiss rail system, you can taste as much as you like since it’s just a few blocks walk to the regional train station and back to Lausanne. When I put the word out on Twitter I was coming to Lausanne, a bunch of people pointed me toward Blondel chocolate shop. And it was the first place I made sure to visit upon my arrival. Located next to a branch of Ladurée, this classic shop is narrow, so you’re never out of arms reach of something chocolate. 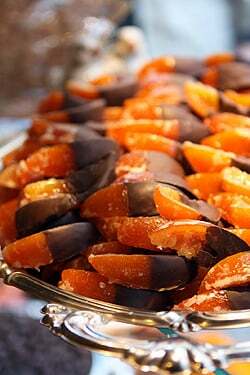 I was particularly impressed with the shimmering candied orange slices dipped in dark chocolate and the old-fashioned charm of the place made me want to stay in there and inhale all the Swiss chocolatey vapors. 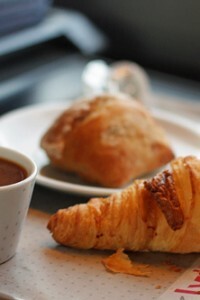 Another pastry shop that I adored was Zurcher, in the lakeside town of Montreux. (Although it’s kind of silly to call anything here “lakeside” since everything is located pretty right by Lake Geneva.) This quaint pastry and chocolate shop has a tea salon where you can have a nice lunch, then head over to the counter and choose from some of the rather pretty Swiss pastries. I was full but made room for three tea cakes; a honey-almond square, a bumpy hazelnut shortbread, and a thin spice bar filled with apricot jam, which I asked if it was one of my favorite Swiss treats, Zimtsterne, but found out it wasn’t. It was very good and somehow I took one (or three) for the team and managed to eat all of them. 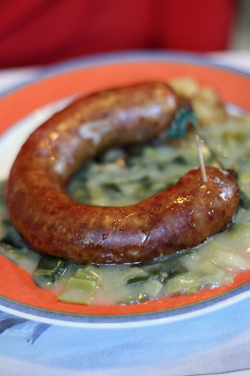 Aside from my copious testing of local specialties, like Raclette, Fondue, pan-fried lake perch, and of course, Zürcher Geschnetzeltes, I attempted to tackle a big plate of Saucisse au chou, smoked sausage made with cabbage. Yet I met defeat. 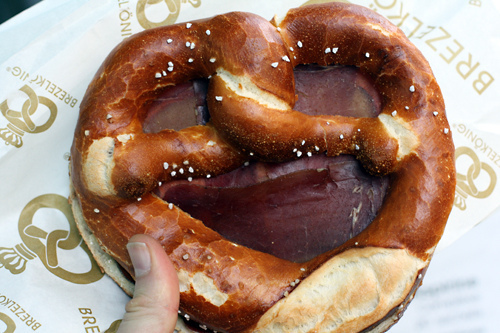 However being a pretzel lover, I had better luck just outside the Globus department store (where I was looking for a metal raclette spatula), at Bretzelkönig, the Pretzel King. Since it was lunchtime, and I’d worked up a hunger strolling through the vast gourmet food department at Globus (which was a bit pricey for lunch), I decided to multitask and have my pretzel as my lunch, and ordered one with butter and thin slices of viande de grisons (lean air-dried beef) sandwiched in between the salty twists of bread. Until I pointed out to her that there was an ’11,’ in front of that., which brought the total to nearly twelve thousand dollars. So I put it back. 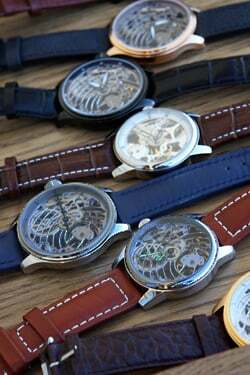 I know these watches can take weeks to make but if you’re interested in giving Swiss watchmaking a try yourself, you can with Olivier Piguet. The Ecole Hôtelière Lausanne is considered the world’s best training ground for those going into the hospitality business. And they only accept about one-third of the applicants for the highly sought-after places in their program. Young people come from a variety of countries to learn not just how to manage people, but how to provide top-notch service in hotels, restaurants, and in other businesses. Some of them do go on to become CEOs, Presidents, or General Managers, but no matter where they land, when they finish their studies at the school, they are highly sought after once they graduate. It’s tough to get in and unlike culinary schools elsewhere that will pretty much admit anyone willing to write a check, some of the applicants get accepted. So the students aren’t coming here because mom and dad insisted on it; you have to really want to make the hospitality business your lifetime profession. Having lunch in Le Berceau des Sens, the student-run fine dining room, the servers were professional, but not stiff. And although they get graded on if they made mistakes, it was charming to see them try not to crack a smile if they accidentally let a spot of wine drip on the tablecloth. And I couldn’t help but grinning at the dilemma of a young woman trying to figure out under pressure how on earth she was going to cut uniform slices of cheese from cheeses of various textures and shapes while her professors discreetly observed. Or being told how to cut their hair, trim unruly facial growth, or remove jewelry. Which is something I wondered when I passed by the photographs on the classroom wall depicting what kinds of jewelry, beards, and tattoos were and weren’t acceptable. Food trucks may have taken over the parking lots of America, but with apologies to all the hip folks lurking outside of taco trucks and eating kimchi-filled tortillas, I haven’t heard of one yet dispensing fresh milk and cream right from their farm. Holy cow! If we had one of those in Paris, I’d be there filling up bottles every week. More likely, every day. 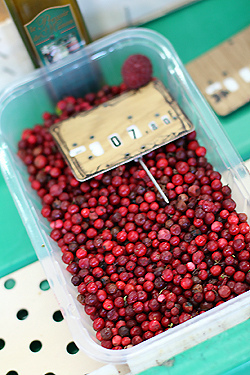 The market wowed me and I just love food markets. 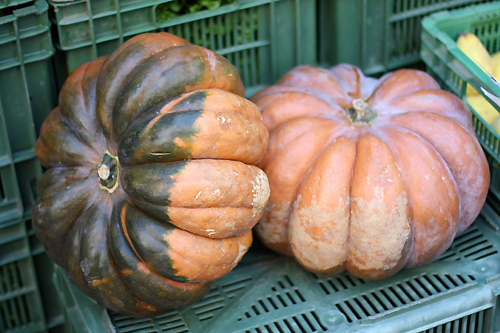 Fruits were a bit scarce, since it was late fall, but squash and pumpkins were everywhere, in all shapes and sizes. Plus rarities like parsley root and yes, even kale (called Choux Nordique) were abundant. And even though I didn’t come home with a Swiss watch, I did have a big bag of that kale in the mini-fridge at the hotel, ready to bring home. Being fall, I saw plenty of wild mushrooms scavenged from the forests outside of Lausanne, and even a few truffles. But if you’re a cheese-lover like I am, it was the fromagers with their runny wheels of Mont d’Or and slabs of Gruyère that were the most tempting. And I had my bag-load of kale, which I was protecting like d’or (gold). 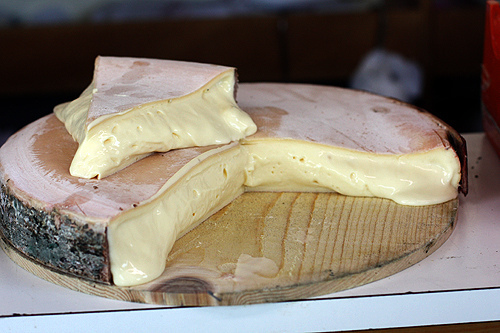 Many consider Mont d’Or the könig of raw milk cheeses since the liquidy, unaged nature of it really makes you focus the flavor of the milk and the cheese. 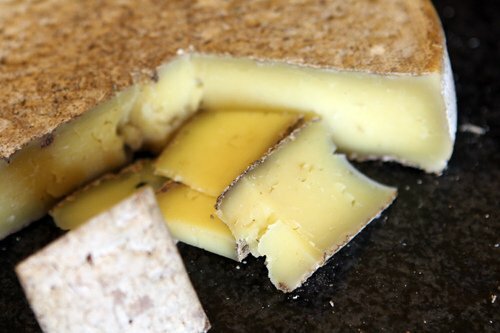 For many years it was not exported to countries like the United States (well, legally at least) because it was a raw milk cheese that was aged less than sixty days. 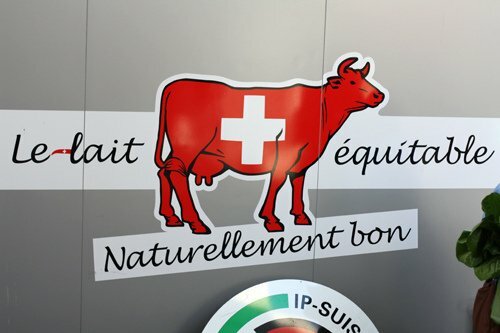 Nowadays all of it is made in Switzerland with thermalized (heated) milk. 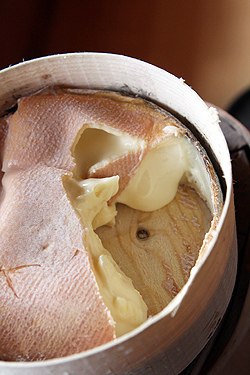 The French version of Mont d’Or is still made with raw milk. 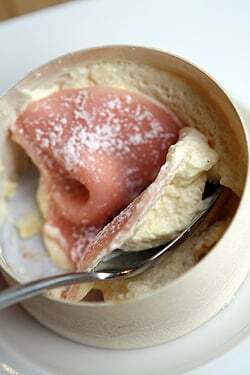 And the best one I’ve ever had was from Barthélémy (51, rue de Grenelle) in Paris. 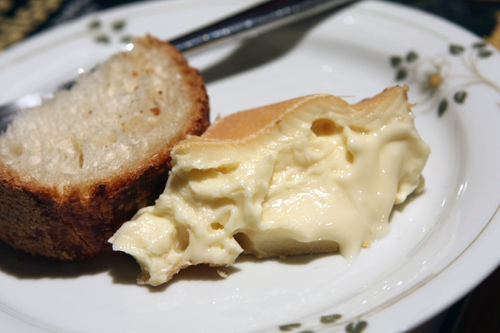 I’ve had extraordinary versions of this cheese, and some less-enthralling. I guess when you know how good it can be when it’s perfect you’re disappointed when it’s not. 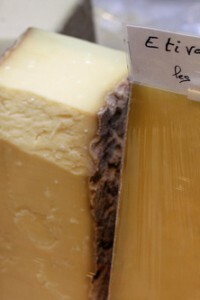 Some locals like to warm it up in the wooden container, which the cheese is ripened in to give it flavor, and will pour a bit of kirsch or white wine over it before baking. 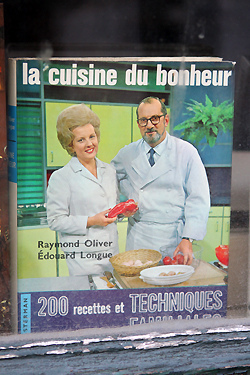 I remember a story about an American food magazine publishing a recipe for baked Mont d’Or, and after a bunch of readers wrote in mentioning that the heat of the oven caused the glue in the box to unband the wooden mold in the oven, they realized that in Switzerland they use staples to hold the box together. But for the United States, staples are a no-no and glue was used for the exports. 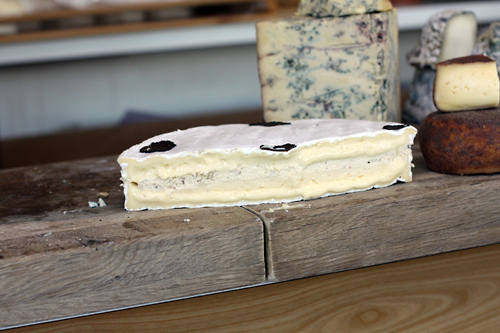 The cheese is such an important part of the region that for dessert at the Brasserie Carillon the pastry chef makes a custard-like cake created in the same wooden box, with a marzipan ‘crust’. (Above, left.) 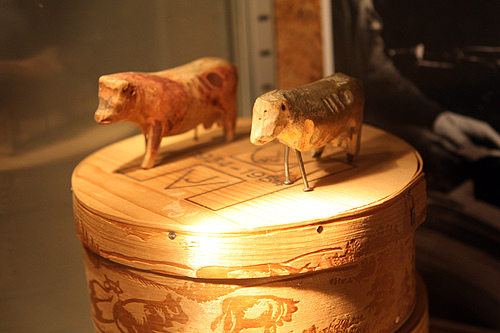 And there’s a Museum of Vacherin up in the Vallée de Joux and I not only saw the history of the cheese displayed, but I got a hefty taste of the cheese as well, directly from the affineur (ripener). Which aside from the gorgeous views everywhere you looked, made the trip up the mountain worthwhile. Many of the rooms have balconies overlooking Lake Geneva. There is a Cuban-style bar with a list of specialty cocktails that’ll knock your socks off (although the prices will make you stop at just two, which is probably a good idea). But best of all, there is a spa and hamman (Moroccan steam bath) in the hotel and you’re welcome to just walk down there right from your room sporting your bathrobe and soak away in the hot vapors. And that was pretty priceless. From Paris, the trip to Lausanne is very easy as there is regular high-speed Lyria train service at frequent intervals during the day. Some trips require a change of trains and others make the trip direct in three-and-a-half hours. 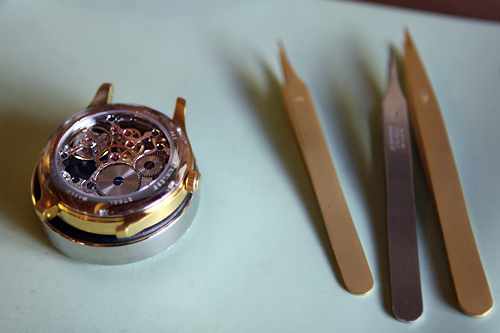 International flights fly directly into Geneva, which is less than an hour away by train from the airport. The best way to get around Lausanne and the region is by train, and by foot in cities. You can get a Swiss railpass if you plan to do a lot of traveling but since distances are short, it probably makes sense just to buy tickets as you go. 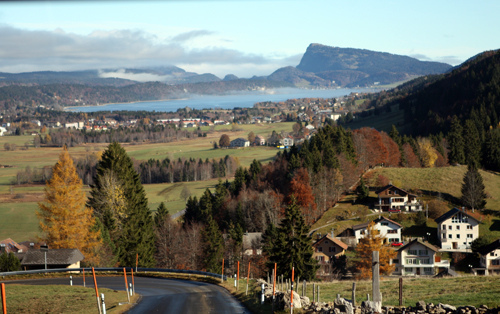 (The Vallée de Joux, mentioned above, is probably best explored with a rental car.) For smaller places, or those on Lake Geneva, train stations are located in the center of towns and Swiss trains and buses are clean and dependable. In warmer months, the train system includes boats that traverse the lake. Like many European cities, locals of all stripes use public transit. Some hotels will give you a free public transportation card, so it’s worth asking for. Most Swiss are multi-lingual and although English is widely understood, it’s always best to ask folks if they speak English if you are an Anglophone. 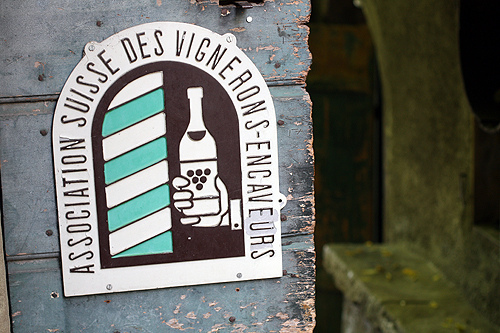 The food is very good in this region, as are the wines, and I recommend drinking only local wine while you’re here. If you’re unsure of what to order, ask the waiter for a local recommendation. Goods and services in Switzerland are not necessarily inexpensive; an espresso at a café costs 3.60CF ($3.60). However if you stick to local specialties, such as cheeses and shop in bakeries and at the market, you can eat well and not break the bank. The Lausanne Palace is a stunning hotel which falls into the luxury category. I’ve stayed at The Hotel de la Paix, which is quite nice and comfortable and less plush than the Lausanne Palace. And rooms are less. I asked a woman from the local tourism board for affordable hotels in the area and she recommended some favorites. 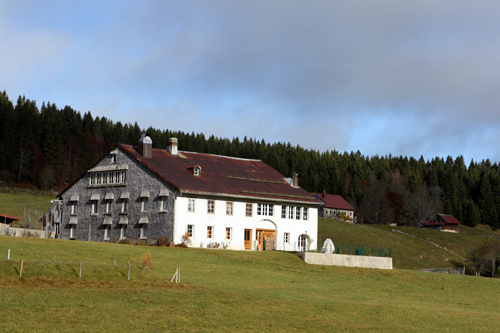 I have not stayed at any of them, and when I raised an eye about the youth hostel she said they had private rooms which were quite clean and affordable. Swiss hotels in all categories tend to be very tidy and well-kept. I’m glad you had a great time in my country! I loved reading your words and rediscovering Switzerland through your eyes. Your should come to Geneva. We have lots of wonderful wines/vineyards and food specialities too! love your post! glad you like our country. your article is very neat, flattering and well-observed indeed. zurich is amazing, too, in both, a culinary and a cultural way. so if you ever need a personal city guide here let me know. many thanks for the inspiration and the praise. Be thankful that you drank your coffees in Lausanne, they are dirt cheap in the Romandie. In Zurich I paid CHF 4.80 which of course is really stealing…. I often remark on coffee prices in visited countries, as they vary from very affordable (Italy, Portugal, Spain) to affordable (France) to a luxury: Switzerland, UK!! But then I think that salaries are much higher in Switzerland too, so they must ask more. Thank you for this lovely, lovely post. I am homesick at the best of times but this in November when my heart is heavy with homesickness….. that’s nearly too much. David! You made it to my adopted country! Wonderful! Yes, for the wine, yes, for the cheese, and yes the Ecole Hotelière de Lausanne is an amazing school! My son is a last year student there, the training is impeccable, but did you know that many of the students do not go in to hotel/restaurant managment? I agree with Rosa, come to Geneva and with Scarlett, visit Zurich!! Rosa; read David’s note….. he will take a culinary tour to Geneva! For me it’s Lausanne that makes my heart beat stronger (and of course, Zurich…) – Geneva, for the rest of the Swiss, is NOT Switzerland – too international, you don’t hear any French only English and any Eastern language, but of course I have very dear friends in Geneva and they can’t praise their town enough… Chacun à son goût! Je te salue bien! I honestly can’t decide what I’m more enthusiastic about: the cheese, or the toilet signs. Thanks for letting us live through your travels vicariously! Love this post…yet another destination added to my wish list. Hello David, absolutely agree about the amazing friendliness in Lausanne! We visited many places in Switzerland this summer, including Lausanne. When we were (hopelessly) looking for a place to park the car, a guy showed up and offered us his own private parking spot – he said it belonged to his office and he did not need it as he was just leaving. These things always warm my heart. The wines from Lavaux are great, too. Now I need some cheese. I really do. Beautiful pics – I’m happy you’ve found some kale eventually. Such a great post! My boyfriend is half swiss and I’m dying to go over there. I will def. keep some of your pointers in mind. Thanks!! The top picture is amazing. Great to discover Lausanne with you. Happy Thanksgiving! Ce n’est pas vrai… yes we are an international city in Geneva and my son constantly teases his lovely girlfriend from Lausanne that she is from the provinces. That does not stop him enjoying the wine from her family vineyard in Lavaux however, but Geneva is a great city as well as Lausanne… Venez David! Vous êtes le bienvenue en Suisse Romande! 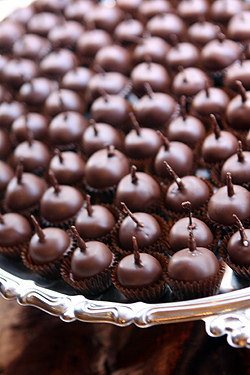 I’ve fallen in love with those chocolate dipped oranges. 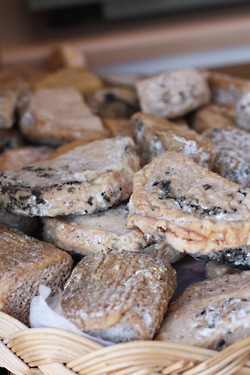 And the pictures of runny cheeses never disappoint! Your swiss-stay sounds divine, especially the hotel. Great travel report. I enjoyed it a lot. Bretzel, Maronen and a good cheese. Can’t wait to go back next summer. I have fond memories of my 7 years in Lausanne. I spent my university years there, and it is a magnificent little city. It is an amazing experience to study with the breathtaking view to the Lac Leman and the golden roofs of Evian on the other side of the lac (for those visiting the university, try the last floor cafeteria of the Microtechnique building). It is also full of interesting small cafés, good beer (Les Brasseurs) and nice places to eat. 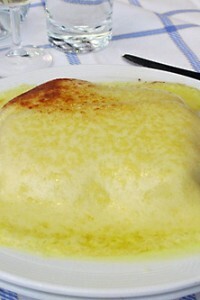 Good fondue can be found in a restaurant close to the Cathedral, Café de L’Eveche. 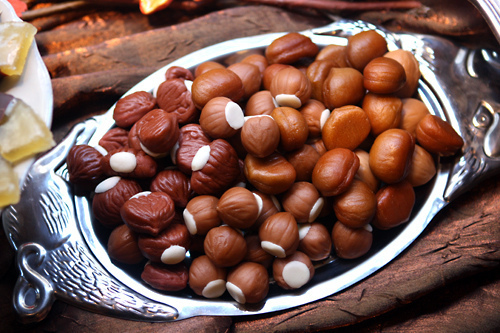 Try the different kinds of fondues from the different parts of Switzerland. Lausanne, a great choice for a trip. I am happy you liked it! This is an exceptional post among your many! Not only one of your longest, but one of the most fascinating to read. It has it all—from a great story and images that enhance every detail. Thank you for a very wonderful Thanksgiving Day read. (I almost didn’t check your blog today—thinking maybe the holiday meant no posts! Glad to be wrong). My favorite Swiss wine to drink when having raclette is Aigle les Murailles. In my remembrances of things past, a sunny day in January, lunch on the outdoor terrace of my hotel in Klosters surrounded by snowbanks of white… there was the crisp, dry wine with the meal. This brought back such fond memories. Many years ago my wife and I arrived there, by train and quite mistakenly. Leaving Paris I attempted to sound as French as possible (hey I was young) when I purchatickets to Lucerne. By the time we realized my error it was too late. We found ourselves soon enchanted and spent 2 days there. Magical city, wonderful food and tasty beer and wine, can’t wait to revisit. I love the WC sign! Where did you see/find them! Fantastic, fantastic story and photos! You’ve made me crave a visit to many of the places you’ve told of, but never before have I wanted to drop everything and book a trip instantly. Very nice article. It does show a Lausanne experience… and, as other commenters mentioned, the openness and friendlyness of the people is amazing (I had surprising and very positive experiences in the past). Getting there, if you are coming in from overseas, flying via Zürich is an option as well, as Genève has very few long-distance flights, and it is roughly 2h30m from Zürich Airport, with a direct train every hour, and an additional hourly connection 30 minutes apart. I’ve never thought much about Lausanne. And I’ve not been lucky enough to visit Switzerland (yet). I’m more keen than ever to go now though. It sounds wonderful. Why is Europe so far away from Australia? It’s most annoying. I love the idea of fresh dairy trucks, narrow little choclate shops, their open air markets, and the humour in their toilet signs. So happy you liked it here! You have to come back for a book signing sometime! Ever since you mentioned your trip to Lausanne and that you found some kale here, I’ve been meaning to ask you where exactly? I keep looking for it but never found it! Was it on the place de la Riponne? Place de la Palud? Or in the posh Rue de Bourg? Or maybe the little sidestreets? Happy Thanksgiving and thanks for your posts! I’m so excited to see parsley root in your pictures. I’ve been getting parsley root in my CSA boxes for a while and never found recipes. After searching in french I’ve found recipes for soups, veggies sides etc. Plenty of “food for thought” and inspiration to use up my supply which is languishing in the fridge. 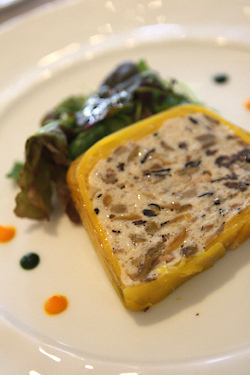 I had thought to grate it like celery root but the french recipes seem tailor made for persil racine. Thanks! Great post on Switzerland. I’m Lusanne putting it on my next european destination list. Great post. I enjoyed it immensely. I love to read your travel stories. Your pictures are as fabulous as your writing! Nice post! Glad to read about your trip in those cities. So much cheese and I love it!! I struggle to empathise with your stress when you get to stress in such picturesque surroundings – with only a train ride!! And such gorgeous food, too. Jealous. Been there. Really loved it, too. 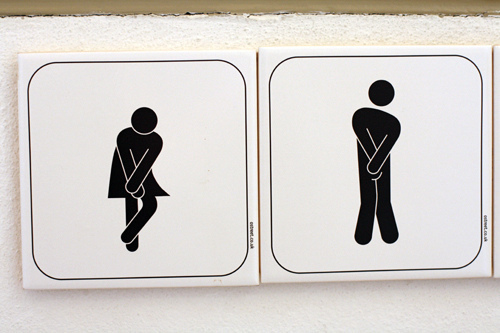 That’s such an interesting write up, it makes me want to go traveling and experience it for myself, I loved the photos of the male and female toilet signs!! What a nice thing to come home to after the Thanksgiving day feast! Thanks! as I knew there was a better world elsewhere having spent a year in an American high school. making it invaluable for the rest of Winter. Best as soup. unsurpassed “Merveille d´oranges” available only at this time of the year and through the holiday season. A perfect gift for the palate of your loved ones. Apart from finding all year round the best millefeuille of Paris according to the discriminating jury of Figaroscope. “on a train to Lyon and the birth date on my ticket was wrong”…hmmm, that’s an amazing case of parallel universe. 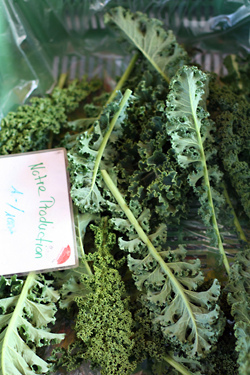 You need to come to Holland for kale–it’s just about the national vegetable. Known as boerenkool (farmers cabbage). In supermarkets you can buy it in bags already washed and chopped up for use in the boerendkool met worst, which is basically potatoes and kale mashed up together and served with a smoked beef sausage. By the way, your parsley root looks to me like parsnips. So for people looking for recipes, that’s another keyword to search on. OH wow, I absolutely adore the signs… can I buy them? What a fab array of photos you allowed us to look at. Happy Holidays. Fully agree with you….. coming originally from the ‘world town’ Zurich I considered Lausanne the ‘comble’ of lovely provinciality… – a statement ‘well founded’ by the arrival of several boys (young men) from Lausanne who didn’t know ANYTHING about life, women, fashion and what have you!!!! My belief that Lausanne was charming but backwards was cemented by my getting in contact with ex ‘Suisse Allemaniques’ who – after years and years in that corner – still spoke French and behaved like they had just jumped from the shrubs…. But I also already half-heartedly LOVED Lausanne at that time and I used to say that I would go and live there once I would have my pension ahead of me – because by then I’d have settled into that slow mode of life! Parsley root is also called Parsnip, is that correct? 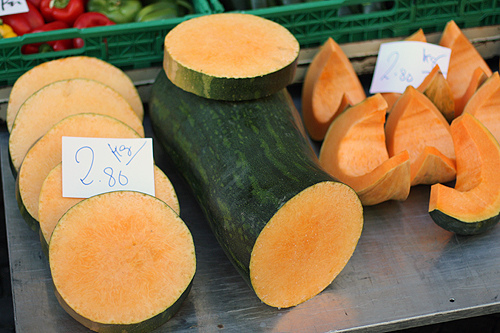 Wonderful post- you have a small typo under the market veg photo (live not like) just wanted to point that out. Hope you don’t mind. Nicole + Barbara: Although they look pretty similar, they are different (unless someone knows otherwise.) 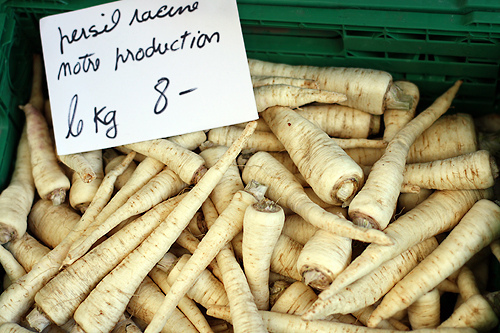 I bought some parsley root in Paris once, which were smaller & they were somewhat spicy rather than sweet, like panais (parsnips), which go by a different name. Céleste: I don’t recall the exact location of the folks selling kale, but I did see it at at least 2 stand. Didier: Sometimes in France is you buy tickets online, they ask for your birthday. In fact, I bought one yesterday for just a short trip (1 hour) from Paris and they asked for my birthdate for the ticket. Sometimes if you get a ‘deal’, they’ll require that so you can’t resell it. suedoise: That’s a nice pastry shop but I really like their bread bakery, Boulangerie 140, just around the corner. NYC Girl: I don”t believe they’re for sale. They were a museum! Jennifer: There’s plenty of walking on my tours to guard against that. 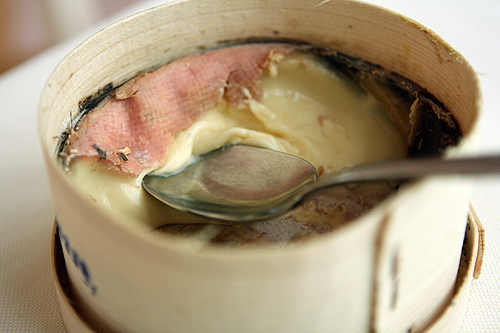 Well, somewhat..
I’m staying in France for a few months and have been looking for Vacherin, maybe I should be looking for Mont d’Or–so glad you posted about it. Sounds like it might be seasonal though, or not available in the Toulouse area, where I am. I love this place. Haven’t been in 35 years but your pictures look as beautiful now as it did then. Thanks anyway! I’ll go and look for it tomorow! looking forward to your visit here Geneva!!! I’ve always been fascinated with Switzerland & really enjoyed your wonderful post, I’m even more intrigued now. I very much miss the excellent travel articles in Gourmet Magazine since they folded. Your writing and top notch photos fill the void. Thank you. Happy Thanksgiving and I am very Thankful for all your information Always!!!! Great post. My father was born in Lausanne but I have never spent any time there despite numerous trips to Switzerland over the years. Sounds like I need to go there next time we are in Switzerland. Ohhhhhh did this take me back. I lived in Zurich a looong time ago, and then returned in my college years to spend a term near Lausanne (in a little town called Leysin). The Zuricher Geschnetzeltis is legendary in my family (along with the more obvious fondue and raclette). I think maybe Rosti (pardon the missing umlaut) is more a Zurich thing than a Lausanne thing, but I covet that as well, and the little Zwiebelkuchen they sold on the streets in oldtown. When I was there, the Jelmoli store in downtown Z was the only source for peanut butter. I’m sure that has all changed…. I’ve never been to Lausanne but am now enticed to go there based on your post. 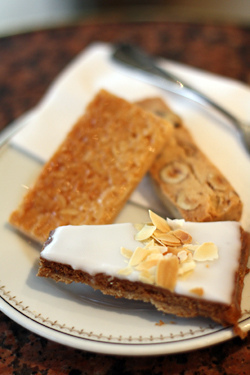 By the way, have you ever tried the baked goods at the Sprungli bakery in Zurich airport or downtown Zurich? If so, what cake and pastry did you like the best? I’ve only sampled a few of their baked goods from the Zurich airport branch. I am a fan of their vanilla and hazelnut flavored luxembergerli and a type of butter cake baked in a small bundt pan but sadly, the name of the cake escapes me. I brought some back to the States to share with my family. I wish I could remember the name of this special Sprungli butter cake. One more question, what are you planning to bake and give away as gifts this holiday season? Love this post, David! I feel as if I’ve taken a wonderful trip to Lausanne, myself. All that swiss food looks amazing! 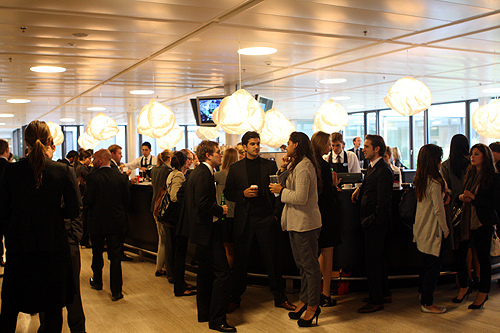 David, KiKi and I will both welcome you to la Suisse Romande… and I’m so proud to see my son lurking in your photo of EHL and no, I will not tell you which handsome student he is! Thanks for your outstanding blog David and :) to KiKi! David, I’m glad you came to my town and did appreciate it. Café du Grütli is my girlfriend favorite place to have a fondue and I often see Willi Prutsch at his terrass when going to my yoga class. André Macheret also happens to be my favorite cheese vendor, I’m so glad M. Prutsch buy his cheese by him. Unfortunately I did not see on Twitter that you were coming so I could’nt give you any recommandation. If you happen to come back in Lausanne, you should really pay them a visit. I would be happy to offer you a coppetta of gelato. Great post. I have not been to Switzerland in over twenty years; you remind me that I loved being there and should plan a return trip. 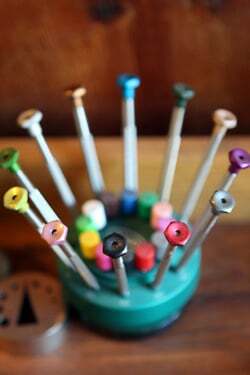 I was hoping that the post would include a great cheese fondue recipe…can you post one from your recent travels? Thanks and Happy Holidays! Eileen: I did post a Fondue recipe and it’s linked at the end of the post. Enjoy! Xavier: He’s such a nice guy, I do hope to return. And thanks for the heads-up on the gelato spot. Arlene: I usually make loaves of Persimmon Bread and hand them out. Everyone loves them. 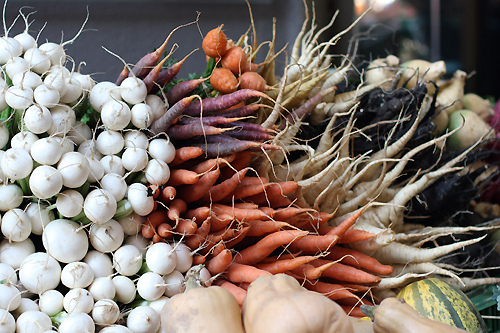 More beautiful pictures of pumpkins, squash, parsley root – I just love those root vegetables! And the cheeses – I could taste them. Not only are you such a talented baker, but a fine photographer and writer. You should consider publishing a book of just your photographs and descriptions of food from all over the world – both are priceless. Just getting caught up on reading your blog and low and behold saw this entry on Lausanne. It brought back so many memories of our years in Geneve. The Mont d’Or . . . so delicious, the chocolates . . . divine. Thanks for taking me back. My husband teaches in Geneva and we always joke about how absolute rule-following sticklers they are (esp compared to French!). 2am, red light, no cars in sight — the Swiss person waits for the ‘walk’ sign, because that’s the rule. My fave, though, is the ‘no peeing standing up or doing laundry after 10pm’ sign that I saw in an apartment building. Question- I had one of the most amazing chocolates EVER from a chocolatier in Geneva- Zellner (or Gellner- the script writing is imposisble to tell). It’s a pave glace- (pah-vay- I have no accents on my laptop) the texture is *almost* truffle-like, but there’s not an outer coating. I hadn’t ever seen them before- or since. 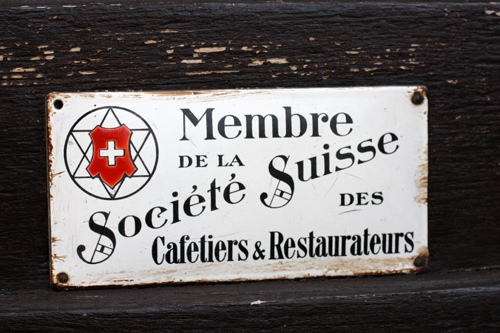 Are they a Geneva thing, a Swiss thing or really common and I just never noticed? How do they achieve that texture- like a very intensely chocolate cloud that just melts on the tongue and then whispers away, leaving no coating of cocoa butter or fat, but just a sort of ‘essence’..Thanks! Thanks for the advice on where to get Mont d’Or in Paris. We went to Barthelemy and got a lovely one. A wandering yielded fromage nirvana. Merci! 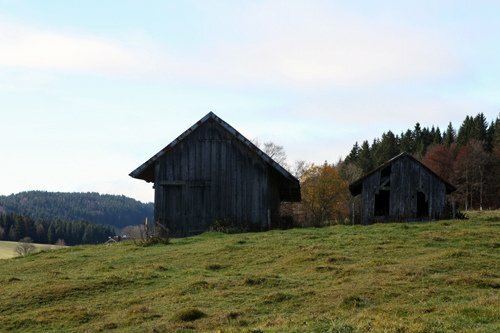 whaen u talk about switzerland….. ahhhhh….. (sighhhh)… its just a dream for me. i have tried to visit this beautiful place twice in my life. but both times., some problem arises due to which i could’t go there.